The other day someone said something to me about my blog....blog? Oh, yea! I write a blog. Opps! Sorry it has been a while. 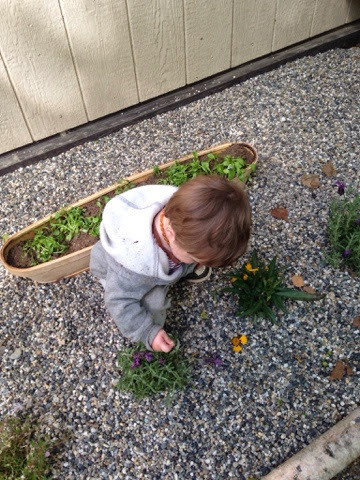 The kid was sick, then the husband was gone, and then my brain was focused (obsessed) with my garden. The weather has been nice and the sun doesn't set (well, it does, but I am never up that late, and when I get rudely awakened by a certain 1 year old, it is never truly dark.) 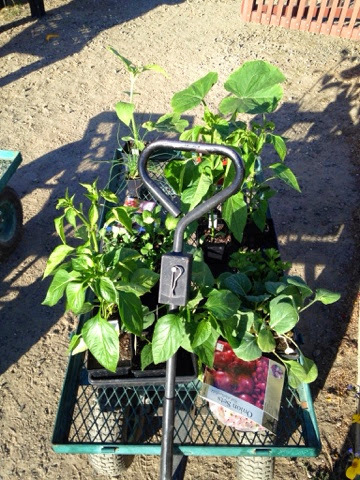 Gardening season is upon us! This is what I have been plotting and planning since we moved to our first tiny apartment in Seattle. 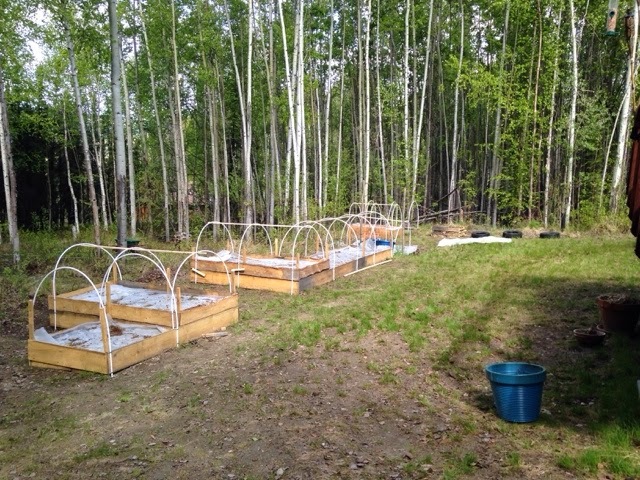 I spent the fall making raised beds and have been counting down the days until I was able to plant. That time is here...almost. Apparently the "rule" is to not plant until June 1st. June 1st came and it was 47 degrees. I'm not a gardening expert but I took the 47 degrees + massive wind storm as a hint to wait a few more days. 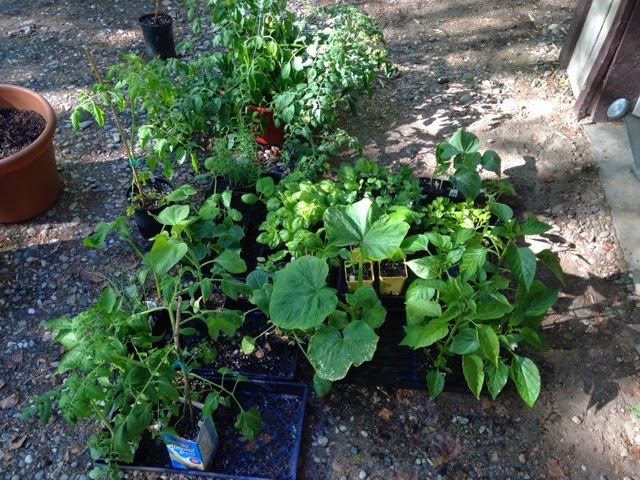 Earlier this week I went to a greenhouse a few miles outside of town and picked up my plants so I can start hardening them up. Originally I planned on only planting vegetables that are edible, but I couldn't pass up the 500# pumpkin plant (Atlantic Giant.) The plant itself is crazy with how fast it grows. I'm excited to see how it does outside. 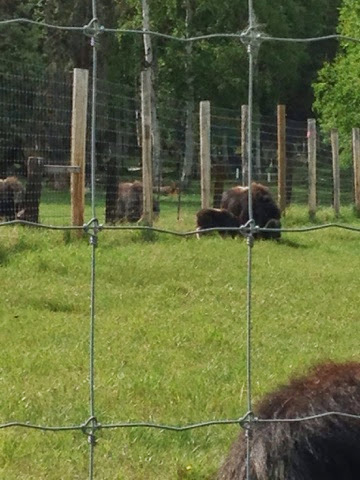 Even more excited if the #@!$%# moose don't get it. I also bought two OS Cross cabbage plants. The lady helping me told me I needed to plant them 6 feet apart because of how big they get. Can anyone say sauerkraut!? I also bought a Russian Sunflower that is suppose to get huge. So, my reasonable garden turned into a garden of giants. Which would be easier if it A. Rained and B. I didn't need to haul water. I did my first run to the well on Friday night and got 22 gallons of water, and my water container (the first one didn't work, so I bought a garbage can and made that one into the water system) holds 32 gallons. I get the idea that I will be doing many a trip to get water this summer. Especially when it gets warm out. It does get warm at some point, right Fairbanks people?! Saturday I went and got another truck load of dirt, and am so excited to make a few more gardens out of the tires I got at the Transfer Station. What I don't use to plant is going into our attempt at growing grass in the front yard! Plants out of the garage enjoying the sunshine. Bug is doing well! He is talking more and more. The other day he put his shoe on when I told him to (never in a million years guessing he would actually go get his shoe and put it on.) He is pretty much the coolest thing EVER. 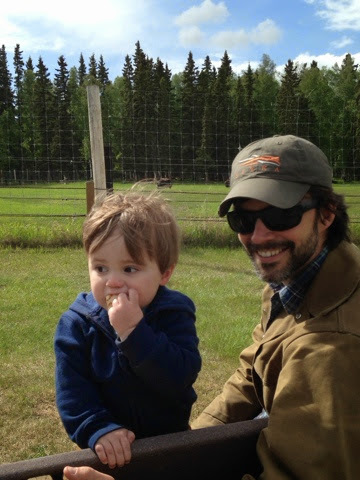 Saturday we took him to the Large Animal Research Station (University of Alaska-Fairbanks) to see Musk Ox and Reindeer. He loved it and ran all over. I wanted to try to smuggle out a baby Reindeer because OMG THEY ARE SO CUTE!!! Lol you cheated their are no comments here. Looks like a load of fun. :D I wanna see bug next to your giant cabbages! Bug and Adam are adorable. What's the moose-proofing solution other than pray?